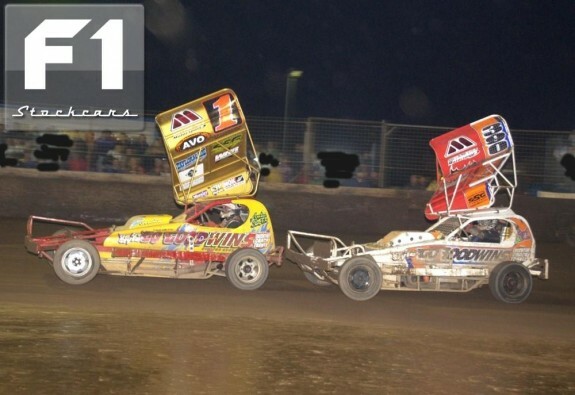 Kings Lynn’s annual Halloween Carnival Night saw a bumper crowd and a mid thirties attendance for Round 9 of the National Series Shootout, with eight of the ten eligible shootout drivers making the meeting, Mat Newson (16) and Lee Robinson (107) missing out due to injury and engine problems respectively. As is the norm at the Norfolk Arena, the first F1 event was for Whites and Yellows and featured 16 cars. Pole starter Tim Warwick (307) and Graham Wagstaff (330) were on the front of the grid, with Warwick getting the drop as the green flag flew. Robert Broome (41) and Geoff Nickolls (215) both turned around on the home straight in the early stages as Warwick set the pace from Wagstaff and Mick Rogers (244). Fans favourite Warwick was looking strong, and at half distance had a reasonable lead over Wagstaff, who was passed by Rogers with 3 laps to go. The 244 was flying and closed considerably in the last couple of laps, but couldn’t get close enough to the lead car and Tim Warwick took the flag for a popular victory, Rogers placing 2nd with Wagstaff in third place. Heat 1 gridded 23 cars consisting of 4 whites, 6 yellows, 4 blues, 4 reds and 5 shootout drivers 515-259-21-390 and 4. Graeme Robson (267) was on pole, but Wagstaff headed them off at the drop of the green as Jim Bamford (302) and Joe Booth (446) had a look at the marker tyres down the back straight on lap one. Hayley Parkinson (54) and Ian Brickley (246) had become locked together in turns three/four and helped create an 8 car pile up which brought out the waved yellows to clear the track. On the restart, 330 continued to lead from 129-307-215-212(lap down)-515, the first s/o driver to feature, with points leader Stuart Smith Jnr (390) back in 8th. 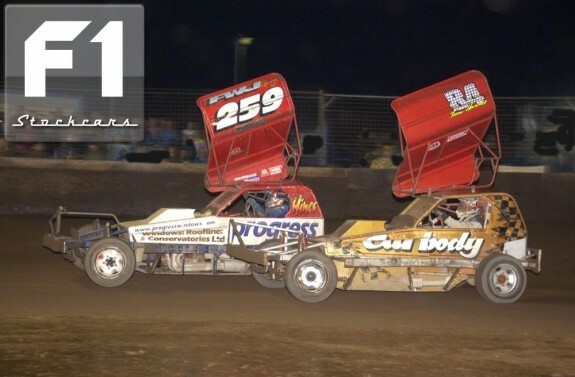 On the resumption, both Mark Gilbank (21) and Dan Johnson (4) passed the 390 machine, whilst up front, at the halfway stage, FWJ had gone into the lead from an on form Paul Hines (259) and Wagstaff third. Disaster was to strike the 515 car as with the 5 lap board about to be shown, Wainman Jnr disappeared in a cloud of smoke around turns three/four and came to abrupt halt by the fence, his race and possibly his meeting, seemingly run. Hines didn’t need asking twice to pick up the pieces and the race win, heading home fellow shootout drivers Gilbank, Johnson and Smith Jnr. Post race analysis suggested that a blown engine would cut Wainman’s progress short for the meeting and the shootout, but his race team had other ideas, as news filtered from the pits that an engine swap would see Danny Wainman’s (212) power plant transferred into the 515 machine. 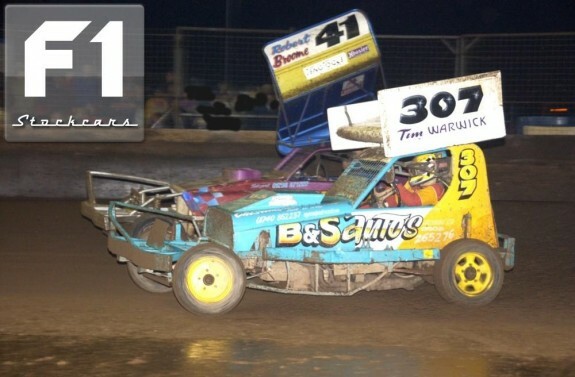 It then became a matter of time as to whether Wainman would make it out for his other designated heat. The race against the clock, was on. The second heat saw 18 cars on track with Russell Cooper (415) into an early lead from Luke Dennis (192) and Warwick as Kevin Shinn (121) went into a spin on the home straight on lap two. Brickley and Murray Harrison (97) both bounced the fence in front of Mr Starter as Broome went backwards into the plating on turns one/two. World and British Champion, Andrew Smith (1) was flying and up into 7th place as early as lap 4. John Lawn (441) challenged Cooper for the lead into turn three, but got crossed up and was T-boned by the following 307 car and spun backwards towards the armco. The flying 415 continued to lead as the Union flag was shown from Rogers, Smith, Craig Finnikin (55) and Paul Harrison (2). The 244 machine made a bid for the lead on turn three which was successful with the Gold roofed car follwing through in to second by lap 9. As the lap boards were being shown, Smith slipped passed Rogers into turn three to take up the running, with Finnikin also finding a way passed the yellow grade driver for second place. Rogers race then threatened to be ruined as he momentarily hooked up with Johnson on turn four with a lap to go, Johnson then passing Tom Harris (84) on the final turn for 6th spot, with Rogers finally placing 7th. 19 cars for heat three, with Wagstaff again shooting away from the front of the grid. Shinn and Colin Nairn (280) scraped their way down the fence on the home straight in the early stages as Andy Ford (13) from the yellow grade moved to challenge the 330 car on turns one/two and moved through for the lead. Ford-Wagstaff-Cooper were the 1-2-3 as Steve Lewin (129) driving the Newson shale car got involved with the marker tyres on the home straight. Ford had quickly opened up a quarter lap lead over the chasing pack, but suddenly had to pull off with steam coming from the engine compartment at the half way stage. World Champion Smith, who was flying on the Saddlebow Road shale, inherited the lead from Cooper and Smith Jnr who was on a charge. The 390 car went passed 415 and hastily set about catching his brother Andrew. With 5 laps to go, Smith Jnr was gaining fast, the 390 car seemingly adapting well to the slick shale track. Into the last lap and the national series shootout leader was all over the no1 car, and a perfectly timed attack on the back bumper saw him move Andrew aside on the final bend to take a well earned win, and open a more substantial gap at the top of the points chart, in the chase for the silver roof. 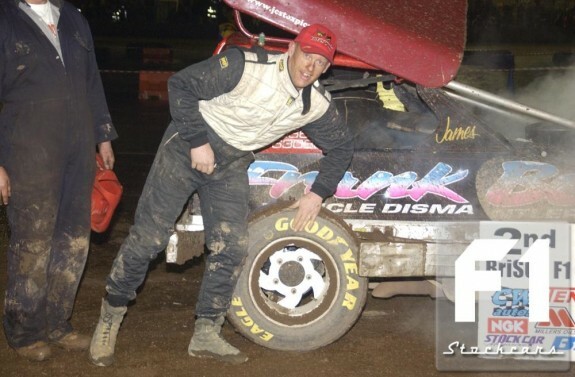 After an heroic effort from his race crew, FWJ took his place on the grid for the final, after having transferred an engine from brother Danny’s car to his own car in between heat one and the final. 18 cars in total made the field with 3 whites, 3 yellows, 3 blues, 2 reds and 7 shootout drivers ready for the green flag. From the white grade, Cooper and Dennis were first to show with Shinn showing well from the yellow grade, Mark Woodhull (335) first blue, Murray Harrison (97) first red and Hines first of the shootout drivers. The 97 car was flying and was quickly able to challenge 415 for lead position which he did on the far side, with Smith also well advanced. 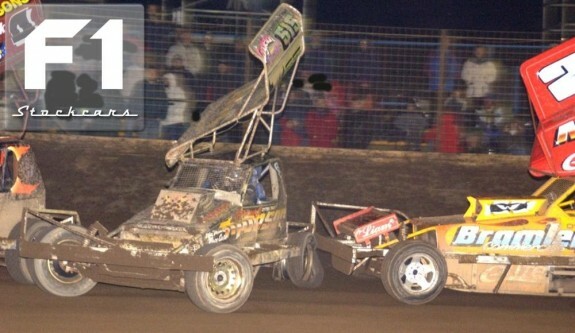 Further back Wainman (515) put Woodhull into Smith Jnr, but any thoughts that Wainman may have had of success in this race were wiped out as Gilbank spun him into the fence on turn one, the 515 car sustaining a flat inside rear tyre to add to his woes and he pulled to the infield on the back straight. Up front, Murray had a significant lead as the lap boards were displayed, with 2nd placed Andy Smith able to make no impression on the flying 97 machine. And so it was Harrison who held on for the win, Smith having to be content with second and Paul Hines again continued his good current form, coming home third. There was some debate down to the legitimacy of Harrison’s win as he had been running a Goodyear tyre on the rear outside, but this was cleared up due to the fact that Hoosier were not at the track to supply drivers new rubber, so Murray was able to run the only tyre available to him which was Goodyear. The final race of the night, the Grand National Championship Qualifier, saw 20 cars on track, final winner Murray Harrison taking the lap handicap. The rest of the field made up of 3 whites, 2 yellows, 3 blues, 1 red and 8 shootout drivers, with Tony Smith (91) and Parkinson starting at the rear of the grid. Lewin failed to make the start which saw Cooper of the front again into an early lead as Johnson bundled Finnikin and Chris Brocksopp (338) in on turns one/two. Johnson then found his way into the fence himself on turn three and became stranded on the racing line which brought out the waved yellow flags. The order on the restart was 415-267-244-446-335. Cooper had a look at the fence on the restart as Graeme Robson took the lead with Joe Booth spinning out of turn two. Robson soon had Hines and Tom Harris (84) breathing down his exhaust pipe, Harris taking up the lead position by halfway. Harris completed a trouble free drive to the chequered, with Hines posting another strong result by placing 2nd, Smith third, Smith Jnr fourth. Another dose of bad luck befell the 515 car, Wainman pulling off in the closing stages with what appeared mechanical problems. So with just the final round of the shootout to take place at Belle Vue the destiny of the silver roof for season 2010 was looking certain to be Rochdale, but to which recipient? All will be revealed at Kirkmanshulme Lane on November 1st!